A plan would put a bike and footpath on the Verrazano Narrows Bridge. STATEN ISLAND — A transit advocacy group wants tourists and others in the borough to be able to bike or walk across the Verrazano-Narrows Bridge in a contentious push to make one of the longest spans in the world more pedestrian friendly. Transportation Alternatives, a pro-walking, bicycling and mass-transit group, has begun a push for the construction of a bicycle and pedestrian path across the Verrazano-Narrows Bridge. 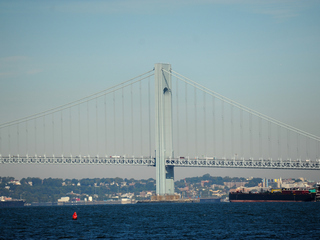 The Verrazano bridge bike path is part of the group's proposed Harbor Ring — a 50-mile route for walkers and bicyclists that connects the waterfronts of Manhattan, Brooklyn, Staten Island and parts of New Jersey. "It is now a bridge that lacks access for all users. The need is still very much there," said Dave Abraham, of Transportation Alternatives. "Imagine being able to avoid the $12 or $15 toll and just having a pleasant bicycle route to go back and forth." Abraham, who rides over the bridge during the annual Five Boro Bike Tour, said that during the trip, riders always takes pictures of the view. He believes that plenty of tourists want to do the same. "Everyone gets off their bikes and takes photos and just gazes in awe at that view," he said. "It'd be nice if you had that view all year round." The MTA, which manages the bridge, said it has no plans for such a project or money allocated for it, and that the agency is instead focused on an effort to upgrade the upper level of the bridge. "While we understand why many people would like to see a bicycle and pedestrian path across the Verrazano Bridge, we are currently focusing on a multi-year effort to replace and upgrade the entire upper level of the nearly 48-year-old bridge," said Judie Glave, a spokeswoman for the MTA. While supporters of the project have already emerged, Abraham said, Staten Island Borough President James Molinaro called the idea "ridiculous" and a waste of money, the Staten Island Advance reported. "I think it's absolutely ridiculous, across the Verrazano Bridge," Molinaro told the Advance. "It doesn't make sense. How many people would use it? It's got to be worth the effort and the cost, for everything you do." Molinaro did not respond to request for comments for this article. Abraham countered that except for the bridge path, the majority of the Harbor Ring route would not be that large and expensive of a project. Nearly 28 miles of the route is in already place, and the majority of work for it would involve putting up signs, benches or painted lines, which Abraham expects to be implemented piecemeal. "It's going to take years, maybe decades, for it to be fully realized," he said. Transportation Alternatives has not designed or planned how the walkway would be put into place on the bridge, but is simply trying to build support for the idea, Abraham said. He added that the bridge, which opened in 1964, was originally mapped for pedestrian and bicycle use, and engineers have told him the original plans may still be used. "It is most definitely feasible to do," Abraham said. "Maybe those plans need to be adjusted or changed entirely, [but] it does seem like it's still very much a possibility. We don't want to advocate for an idea that's too much of a pipe dream." The original mapping would put the bike path on the outer-edge of both sides of the bridge near the cables, Abraham said. While Abraham agreed the cost would be great, he believes the path would be worth it in the end. "I really think the payoff would be tremendous," he said. "We have all these gems that a connected Harbor Ring could give better access. It would just continue to pay off in the future." Abraham wasn't sure why the walkway was never installed when the bridge was originally built, but heard rumors that notorious urban planner Robert Moses feared suicide attempts on the bridge. The height of the Verrazano-Narrows Bridge makes it one of the most dangerous in the city for jumpers, since chances of surviving a fall from it are slim, according to the New York Times. Abraham, however, doesn't think building the pedestrian walkway would increase the number of suicide attempts off the bridge, and he hasn't heard any complaints or worries from people who think it would. Transportation Alternatives hopes to start a massive push for pedestrian and bike access to the bridge in 2014, during the 50th anniversary of its completion.